I can't believe how quickly fall is already beginning to fly by. I want to hold onto this season for as long as I possibly can. 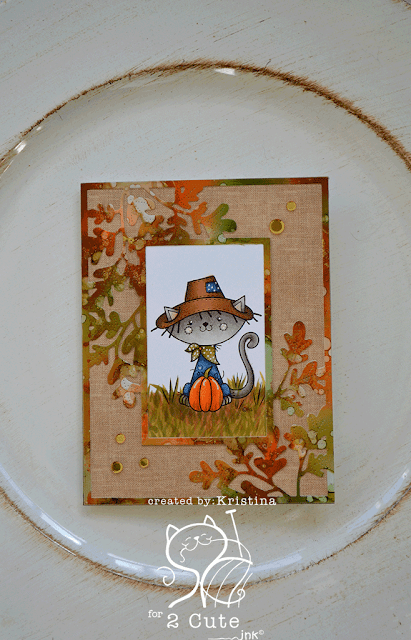 I guess that means I need to keep on making fall themed cards to share so here we go with my next creation! This scarecrow cat digi stamp is just so very adorable. You can add him to your collection right HERE. He's an absolute steal for $2.99!! A whole lot of love went into this card. I'm sorry I forgot to take pictures along the way. I tend to get caught up in the creating and forget to snap photos. I'm working on it! 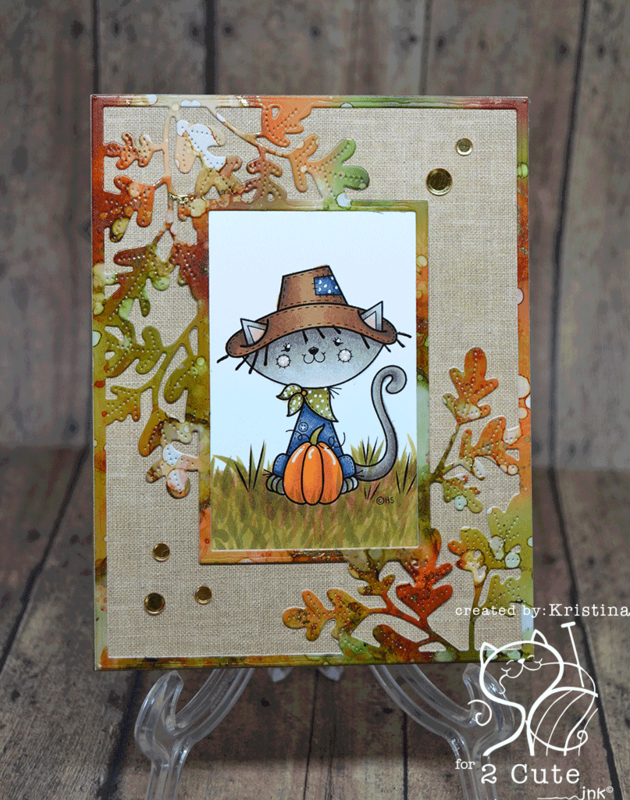 The whole project began by playing with alcohol inks and Yupo paper. I love just sitting and seeing what I can make the colors do with the alcohol inks. I started by putting a bit of blending solution all over the piece of Yupo. Then I started adding random dots of Valencia, Rust, Meadow and Oregano. I like to use a straw to blow the colors around. Add a little more blending solution, more inks and so on. If you've ever worked with alcohol inks, you know how this goes. Once I was pretty happy with my background piece, I mixed a bit of the gold mixative with the blending solution. I then used a paint brush to splatter some of the gold onto the background. I set it aside to dry for about 10 minutes. I grabbed a scrap piece of gold foil leftover from a previous foiling project. I layed it down on different sections of the background and rubbed it with my fingers. When you pull it back up bits of the gold stay behind on the semi sticky portions of the ink. Can you say instant bling? After it was totally dry, I die cut it with a beautiful die from Papertrey Ink. Love it! I used a white, gelly roll pen to add a details to the eyes, cheeks, patch, kerchief and pumpkin. I cut the kitty piece down to just a little bit larger than the rectangle opening so I could glue it to the backside of the die cut piece. I dug through my paper stash to see what would work as a background for the inked piece. 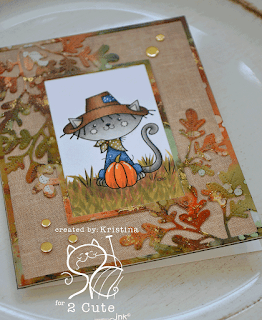 I found this linen look piece in Echo Park's Celebrate Autumn 6x6 paper pad. I glued the die and the paper together. I then trimmed it down to fit an A2 sized card base and glued it on. For my finishing touches I added some metallic gold confetti sequins from Pretty Pink Posh. Voila! Remember, there are tons more great digital stamps to be found in the 2 Cute Ink Etsy store right HERE!